Morris had six carries for 28 yards in Sunday's 18-15 loss to Arizona. 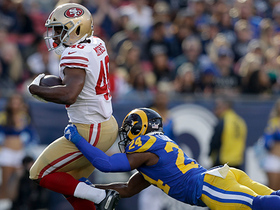 Analysis: Starter Matt Breida (ankle) suited up and led the backfield with 16 carries, leaving six touches for Morris. 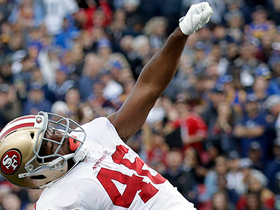 The veteran received four more carries than fellow backup Raheem Mostert, signalling that he has reclaimed the primary backup job in San Francisco. Assuming Breida's ankle is fully healed, Morris' value will be touchdown-dependent Thursday against the Raiders. Morris managed just 25 yards on nine carries in Sunday's 39-10 loss to the Rams. 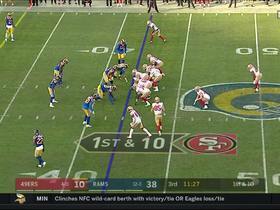 Analysis: Morris' nine totes actually led the 49ers' backfield, but the veteran produced a team-low 2.8 yards per carry. Still, it was a positive development after the 29-year-old did not record an official carry against the Packers in Week 6. The team is planning on reassessing the health of starter Matt Breida's ankle after he aggravated the injury Sunday. 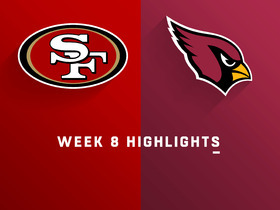 If he is unable to go against the Cardinals, Morris figures to share backfield duties with Raheem Mostert (seven carries for 59 yards Sunday). Coach Kyle Shanahan said Morris' demotion to third on the running back depth chart may not be permanent, Cam Inman of The Mercury News reports. Morris did not receive a carry in Monday's 33-30 loss to Green Bay. 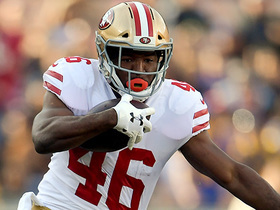 Analysis: Matt Breida (ankle) was able to start, but Raheem Mostert (12 carries for 84 yards) served as the 49ers' second running back. There was no report of an injury to Morris, so this may have been a situation where coach Kyle Shanahan decided to go with the speedier backup option against the Packers' bulky defensive line. Whatever the case, the veteran's fantasy stock took a huge hit following Monday's development. Morris had 18 carries for 61 yards and caught three of five targets for 30 yards in Sunday's 28-18 loss to Arizona. Analysis: Morris got more work than usual Sunday after Matt Breida left the game in the first half with an ankle injury, Unfortunately for Morris, Breida was able to score on a five-yard touchdown reception before he left the game. The veteran runner continues to be a better option in non-PPR formats. He's made just six catches for 66 yards. In Week 6, Morris will square off against the Packers in Green Bay and would be in line for additional work if Breida were unable to go. Morris (knee) was listed as a full participant in Wednesday's practice. Morris rushed four times for 14 yards and caught one of his three targets for four yards in Sunday's 29-27 loss to the Chargers. Analysis: Morris entered the game reportedly less healthy than Matt Breida, so that likely explains why the 29-year-old wasn't as involved as usual after not having seen fewer than 12 carries over the season's first three weeks. Breida wasn't much more effective with his opportunity, so if the seventh-year vet can recover more fully in time for Week 5 at home against Arizona, he'd likely return to his typical role. The Florida Atlantic product has 167 yards and a touchdown on 44 carries this year. 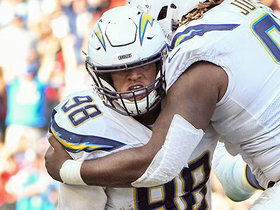 Morris (knee) is listed as active Sunday at the Chargers, Matt Barrows of The Athletic reports. Analysis: Morris didn't make an appearance on the injury report until Thursday, at which point he logged back-to-back limited practices due to a knee injury. Matt Breida, his backfield mate, similarly entered the weekend as questionable with a knee concern, but both players are available to a Jimmy Garoppolo-less offense. Such a reality should afford both Morris and Breida plenty of reps moving forward. Morris (knee), who is listed as questionable for Sunday's game against the Chargers, is expected to play barring a setback, Adam Schefter of ESPN reports. Analysis: Both Morris and fellow running back Matt Breida (knee) are listed as questionable, but a source told Schefter both players should be available for the contest. Schefter did note, however, that Breida is further along physically than Morris, which could point to Breida pacing the San Francisco backfield in touches in Week 4. Morris (knee) was a limited practice participant Friday and is listed as questionable for Sunday's game against the Chargers. Morris was limited in Thursday's practice due to a knee injury, Nick Wagoner of ESPN.com reports. Morris (ankle) wasn't listed on the Wednesday's injury report, Cam Inman of The San Jose Mercury News reports. Analysis: Morris reportedly suffered an ankle injury during Sunday's 38-27 loss to the Chiefs, but it didn't stop him from posting a season-best rushing line of 14 carries for 67 yards and a score. The injury report now confirms Morris' issue was no big deal, unlike quarterback Jimmy Garoppolo's season-ending ACL tear. Meanwhile, backfield mate Matt Breida (knee) was a limited participant at Wednesday's practice after playing with a hyperextended knee throughout much of last week's loss. Morris (ankle) took part in practice Wednesday, Cam Inman of The San Jose Mercury News reports. 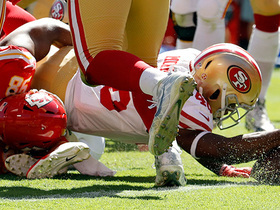 Analysis: Although Morris injured his ankle during Sunday's loss in Kansas City, he appears to be the healthier of the 49ers' backfield tandem. Matt Breida was relegated to working out on a side field Wednesday due to a hyperextended knee suffered in the same contest. As a result, Morris likely will handle first-team reps, at least the ones the 49ers allow him to partake in. Expect the 49ers' situation at running back to work itself out in practice over the next few days. Morris picked up an ankle injury during Sunday's defeat at Kansas City, David Lombardi of The Athletic reports. 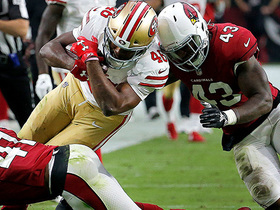 Analysis: Like Matt Breida, Morris missed some time Week 3 due to injury. Unlike Breida, who has a hyperextended right knee, Morris seems to be dealing with a minor concern. As evidence, coach Kyle Shanahan said he expects Morris "to be alright." With the status of the 49ers top two running backs in flux, upcoming practices will be key to determining an approximate breakdown of upcoming reps out of the backfield. Morris toted the rock 14 times for 67 yards and a touchdown in Sunday's 38-27 loss to Kansas City. Morris totaled 48 yards on 14 carries and caught both of his targets for an additional 32 yards during Sunday's 30-27 win over the Lions. Morris toted the rock 12 times for 38 yards in Sunday's loss to the Vikings. Morris told Dianna Russini of ESPN that he expects "a lot of touches" during Sunday's game at Minnesota. 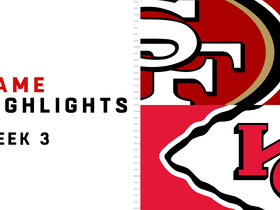 Morris is listed behind Matt Breida on San Francisco's depth chart ahead of its Week 1 matchup with Minnesota. Morris will share starting duties with Matt Breida (shoulder) to begin the season, Cam Inman of The Mercury News reports. Morris' role is set to increase after Jerick McKinnon tore his ACL during Saturday's workout, Matt Barrows of The Athletic Bay Area reports. Morris may start the campaign as the 49ers' starting running back if Jerick McKinnon's knee injury is serious, Matt Maiocco of NBC Sports Bay Area reports. Morris seems likely to stick on the 53-man roster for Week 1, Matt Maiocco of NBC Sports Bay Area reports. Morris carried 17 times for 84 yards during Saturday's 23-17 loss to the Colts. Coach Kyle Shanahan said Morris will be the starting running back for Saturday's preseason game against Indianapolis, KNBR 680 reports. Morris' experience as an early down back could give him a leg up in making the 53-man roster if the 49ers opt to keep four running backs, Nick Wagoner of ESPN.com reports. Morris didn't play in Saturday's preseason game against the Texans. Analysis: Signed at the beginning of the week, Morris began practicing with the 49ers on Wednesday and apparently wasn't quite ready to play in a game. He should have a chance to make his case for a roster spot in next Saturday's preseason game against the Colts. Morris will be one of several running backs getting carries in Saturday's preseason tilt against the Texans, Matt Barrows of The Athletic reports. Morris' pact with the 49ers is for one year and the veteran's minimum, Field Yates of ESPN reports. Morris is signing with the 49ers, pending a physical, Nick Wagoner of ESPN.com reports. The Jets are visiting with Morris on Saturday, Ian Rapoport of NFL Network reports. Analysis: Morris has been available since free agency opened in March, but with an injury hitting the Jets' Elijah McGuire (foot) on Friday, the veteran has earned his first known phone call from an organization. In two seasons with the Cowboys, Morris averaged 4.3 YPC on 184 rushes, but his lack of receiving chops (just 10 catches on 15 targets during that span) doesn't make him a candidate to see the field on obvious passing downs, wherever he may land. Morris remains unsigned, Mike Kaye of ABC First Coast News reports. Analysis: Morris averaged 4.8 yards on 115 carries for Dallas last season, but he's 29 years old and has never shown any ability to contribute in the passing game. Given that he'll likely need to settle for a shot to compete for a backup job, he might prefer to hold off signing until August, at which point injuries will have thinned out the backfield depth charts for at least a few teams. Morris finished the regular season with 115 carries for 547 yards and a touchdown while adding seven catches (on nine targets) for 45 yards. 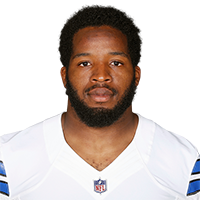 Morris is expected to settle into a reduced backup role over the Cowboys' final two games with Ezekiel Elliott set to return from a six-game suspension, Todd Archer of ESPN.com reports. Morris rushed 16 times for 61 yards during Sunday's 20-17 victory over the Raiders. Morris carried 19 times for 62 yards and caught all three of his targets for an additional 23 yards during Sunday's 30-10 win over the Giants. Analysis: Morris was held to just 3.3 yards per carry against a middling Giants run defense, but a season high in receiving yards helped him produce a respectable showing from scrimmage. While he managed a long gain of just nine yards, he watched as Rod Smith rumbled for 160 total yards and a pair of touchdowns on 11 touches. Morris continues to see the majority of the carries in Ezekiel Elliott's absence, but the emergence of Smith could limit his ceiling next week against the Raiders. 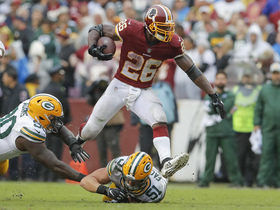 Morris rushed 27 times for 127 yards and a touchdown and failed to bring in his only target in Thursday's 38-14 win over the Redskins. Morris carried the ball nine times for 36 yards and caught his only target for 13 yards in Thursday's 28-6 loss to the Chargers. Analysis: The 13-yard grab was the longest play from scrimmage by any Cowboys RB on the day. Morris seems to be falling into a time share with Rod Smith, as coach Jason Garrett rides the hot, or even the lukewarm, hand in his backfield in an effort to spark the offense, but with injuries mounting on the offensive line and Dak Prescott unable to make anything happen in the passing game, Morris' fantasy value would be murky even if he did have the starting job to himself. Morris carried 17 times for 91 yards during Sunday's 37-9 loss to the Eagles. Morris rushed 11 times for 53 yards in Sunday's 27-7 loss to the Falcons. Analysis: The six-year veteran was the clear lead back with Ezekiel Elliott (suspension) out, seeing six of seven RB carries in the first half and five of eight in the second. Rod Smith saw three carries and all six targets in the passing game, while Darren McFadden wasn't a factor, carrying the ball only once. Morris broke a couple long runs in the contest and should still be the Cowboys' lead ball carrier heading into Week 11 against the Eagles. Morris is on pace to start for Ezekiel Elliott (suspension) during Sunday's game in Atlanta, Ian Rapoport of NFL Network reports. Cowboys coach Jason Garrett said Friday that he hasn't had specific conversations about how the team will divide work between Morris, McFadden and Rod Smith in Sunday's game against the Falcons, David Helman of the Cowboys' official site reports. Analysis: Morris is expected to get the start and have the first crack at the lead job, but Garrett's comments suggest that Smith and/or McFadden also will get some opportunities. Given his lack of receiving skill, Morris figures to cede passing down work, in addition to some of the carries. The situation may need to be re-evaluated on a weekly basis until Ezekiel Elliott returns from suspension in December. The Second U.S. Circuit Court of Appeals set a Dec. 1 hearing date for Elliott's expedited appeal. Morris is expected to start in place of Ezekiel Elliott on Sunday in Atlanta after his six-game suspension was reinstated Thursday, Jane Slater of NFL Network reports. Analysis: Elliott is closing in on his last resorts, legal-wise, meaning the Cowboys will have to rely on their backfield depth to fuel the ground game through Week 15. Morris will be given the first shot to do so, but running back coach Gary Brown said both Rod Smith and Darren McFadden will get in the act as well. On the season, Morris is averaging 8.3 YPC on his 14 rushes. Morris gained 11 yards on his only carry in Sunday's win over the Chiefs. Analysis: Ezekiel Elliott, as per usual, got the bulk of the work out of the Cowboys backfield, but he could finally be forced to serve his suspension beginning in Week 10 if he doesn't get a favorable court ruling Thursday. In that case, Morris would be poised for a much more significant role Sunday in Atlanta, although Darren McFadden and Rod Smith would also be in the mix for touches. Morris is set to remain in a backup role for Sunday's game against the Chiefs after starter Ezekiel Elliott was granted a temporary stay of his six-game suspension Friday, making him eligible to play in Week 9, Dan Graziano of ESPN.com reports. Analysis: Morris was expected to get his first start of the season, but he'll instead man the backup role that has yielded just 13 carries and two targets in six games. He could get his shot at lead-back duties as soon as Week 10 in Atlanta, given that the United States Court of Appeals for the Second Circuit is set to meet next week to potentially overturn Elliott's request for a stay. Morris will start Sunday's game against the Chiefs, Jane Slater of NFL Network reports. Analysis: Morris is getting the first shot to replace the suspended Ezekiel Elliott, who is scheduled to begin his six-game suspension this weekend, barring a last- second legal ruling. On the season, Morris has been the regular backup running back, churning out 8.1 YPC on his 13 rushes. He doesn't have much prowess in the pass-catching department, which may fall on the shoulders of current No. 2 Rod Smith. To round out the backfield, Darren McFadden is expected to remain at the bottom of the depth chart. Morris took the initial snaps with the first-team offense at Wednesday's practice, Todd Archer of ESPN.com reports.